It’s three weeks since I last shared my Finery of Nature cross-stitch with you, I didn’t think I’d done that much, little bits here and there, but the photos show a respectable amount of progress! This is a Dimensions kit I found on the sales table at my Embroiderers Guild, it’s meant to be on black aida, but I’ve changed it to a soft green linen so my eyes can manage it! After much debating I decided to take the silver out, I felt it looked messy and also I felt the silver (which was meant to be gold!) was mainly to highlight things against the black, it just didn’t seem to add anything to the picture. There’s still back-stitching in other colours on the pattern so if I decided something needs a bit extra, I can always use a colour instead without it looking out of place. The border is one place where I’m still trying to decide what to do. The swirls are meant to have a gold thread couched down the middle, I’m still hovering between a silver grey, a dark grey or a dark teal! It would be nice to think I could finish this quarter over the next three weeks, but we will see! This stitch-a-long is organised by Avis, we each choose our own project, work at our own speed, just share our progress every three weeks, it’s a huge motivator, so if you’d like to join us just send Avis a message. Please follow the links to see lots of inspiring hand-stitching. 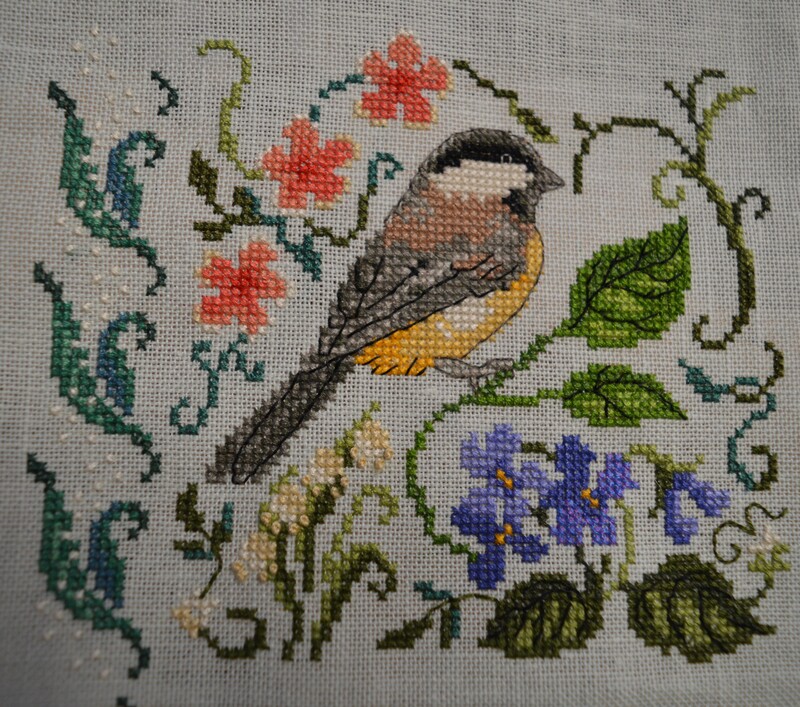 This entry was posted in embroidery, Stitch-a-long and tagged Dimensions kit, The Finery of Nature. Bookmark the permalink. Beautiful, Margaret. I love the violets. My thoughts are to use gold thread, to highlight the yellow gold of the bird. That’s a idea worth thinking about, I might wait until the other three quarters are stitched to see what colour is needed. Quite a lot of progress I would say. Love the subtle orange colour of the flowers. Thanks Debbie, this one is taking a bit of concentration! Loving your progress…such a pretty piece! Those coral flowers are so pretty, a nice pop of color! Great progress, aren’t photos great that way? Thanks Kathy, the photos do help to motivate when you don’t realise how much you’ve done! You’ve made great progress. It’s looking lovely and I’m sure you’ll choose the right colour for the couched bits. 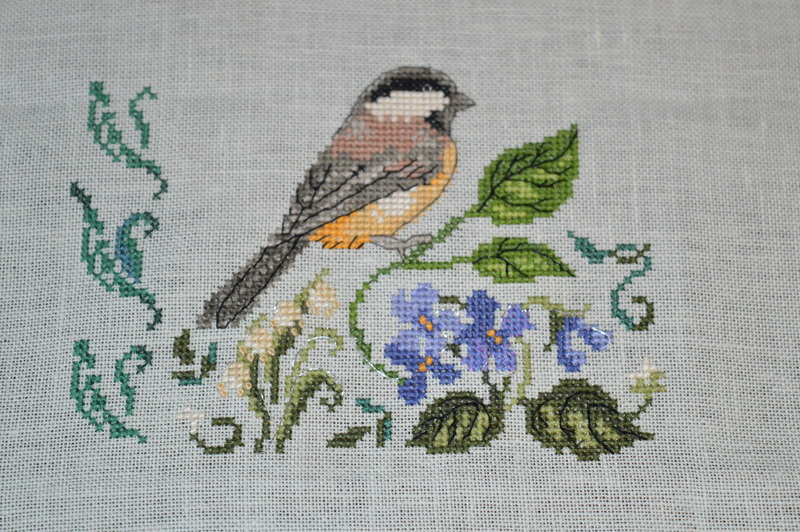 Wow~ you made lots of progress and it looks fabulous…love the orange flowers too! Wow! Isn’t it amazing how working on a piece a bit here and a bit there can add so much progress over 3 weeks time? It looks lovely! Oh how pretty this is turning out! Gorgeous with two of my favourite things, birds and flowers. Wonderful! Ohhh a teal border would look fabulous! Such beautiful work! Great progress! It’s looking great. I would wait till you’ve finished stitching the main elements and then decide what type of highlights you may want in the border. Thanks Catherine, that’s the conclusion I’m coming to, even if it means me stitching it all at the end! Great progress and it´s looking so good!!!! This is so me. I love nature and this one is very pretty and you are rolling along at a nice pace too. I love the detail in a Dimensions kit — and your stitching is so lovely it’s coming together beautifully! I think you could certainly wait and finish the other quarters and then decide what (if any) highlighting you want to use.